UDM Downloads > Stealth Web Page Recorder! Stealth Web Page Recorder is a simple spy software utility for web page recording. 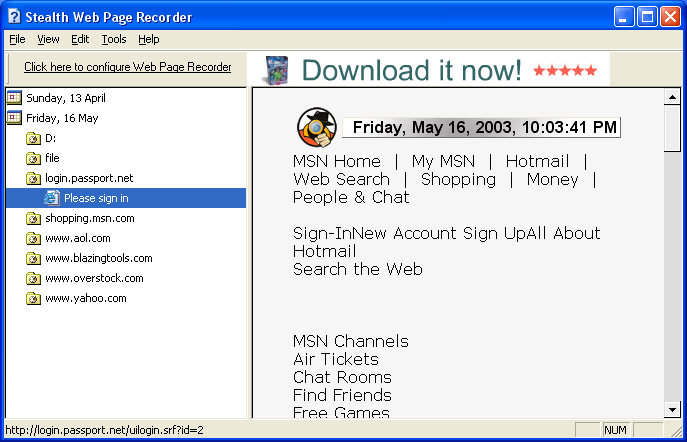 This program will be useful if you want to record e-mail messages of any Web Mail service. Also it can record contents of password protected pages and web pages which use secure HTTPS connection. The new version also captures logins and passwords for the sites. It is absolutely undetectable after the installation. Stealth Web Page Recorder stores the text of web pages visited and lets you easily review the saved information later. It has convenient user interface similar to the History bar in the Internet Explorer. You can configure program to record all web pages or only user defined.